Bring the excitement of disc golf - with a twist - to your own backyard this summer! The object of our Disc Flyerz game is to throw your disc toward the opposite hexagonal can - if it goes through the slot in the front, you will receive 3 points. If the disc goes in at the top, that's 1 point. The first player to score 21 points wins. Bring the excitement of disc golf - with a twist - to your own backyard this summer! The object of our Disc Flyerz game is to throw your disc toward the opposite hexagonal can - if it goes through the slot in the front, you will receive 3 points. If the disc goes in at the top, that&apos;s 1 point. The first player to score 21 points wins. 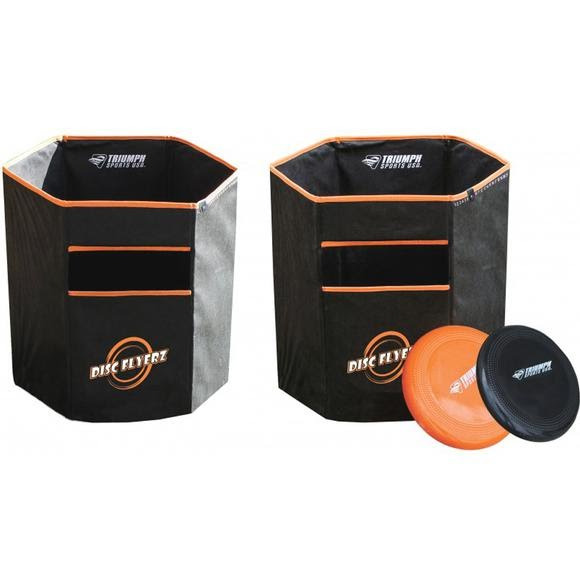 Everything you need to get started is included: Collapsible cans with an easy-to-read slide scoring system, two plastic flying discs and a convenient storage bag. Fast-paced play makes this outdoor activity a winner for competitive players. Measurements Each scoring hexagon: 20" x 16" x 16"